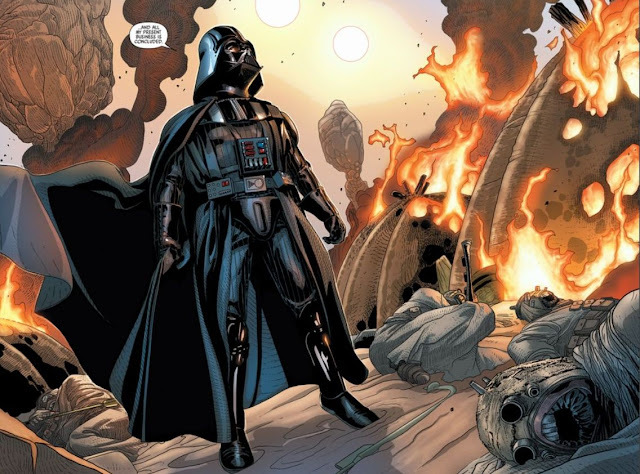 Marvel recently concluded a remarkable 25 issue run of their blockbuster Darth Vader title. 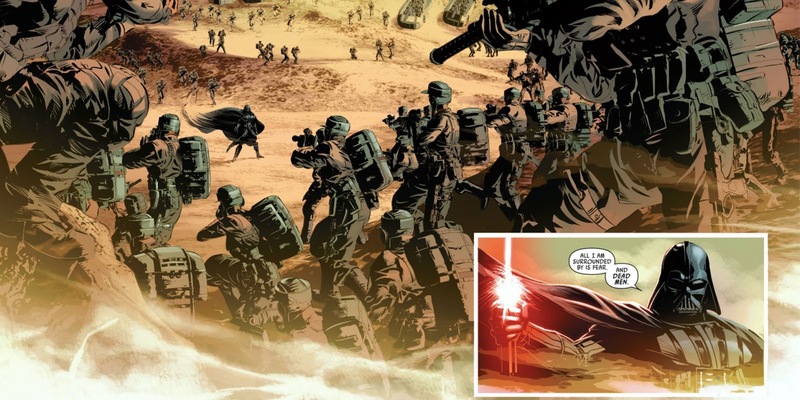 A simply incredible achievement by writer Kieron Gillen and artist Salvador Larroca, Darth Vader was the most provocative, enlightening, and inspiring of Marvel's line of officially canon Star Wars comics. Set immediately after the destruction of the Death Star in Star Wars: Episode IV - A New Hope, Darth Vader thrillingly depicted the Dark Lord of the Sith's attempts to prove himself once more to the Emperor, who blamed him for the failure of the loss of the Death Star. Gillen and Larroca gifted Vader with his own unforgettable supporting cast, including droids Triple-Zero and BeeTee One, hilariously homicidal versions of See Threepio and Artoo Deetoo, and best of all, the rogue archaeologist and droid technician Dr. Aphra, a twisted female version of Indiana Jones and the best new female character in the Star Wars canon (sorry, Rey). Vader also faced off against villainous challengers to his supremacy, including cybereticist Dr. Cylo and his cadre of creations, all of whom sought -- and failed -- to supplant Vader as the Emperor's apprentice. Throughout their 25 issues and Darth Vader Annual #1, Gillen, Larroca, et al delivered a cinematic experience that truly felt like Star Wars at its best, depicting Vader as a calculating, fearsome, and indomitable force, while never compromising his terrifying mystique. Indeed, Darth Vader even gloriously enhanced Vader's mystique, allowing him to perform breathtaking acts using the Force even the movies never did. What's more, Gillen and Larroca sparingly but brilliantly used flashbacks to Vader's former life as Anakin Skywalker, allowing us to delve into his deepest regrets and his torment over his loss of Padme Amidala, which stoked the fires of his obsession to find Luke Skywalker, his newly discovered son. Once more, Luke Skywalker would be surprised to learn that a lot of stuff he famously did, his father did first, and better. That includes fighting a rancor. In this case, Vader faced a rancor cybernetically enhanced by Tulon Voidgazer, a brilliant, evil scientist and one of the would-be heir apparents to Vader. The cyberanimate rancor Vader battled had its pain receptors eliminated technologically. So, when the usual Force Chokes and Jedi/Sith tactic of amputating limbs by lightsaber didn't work, Vader brilliantly used the Force to hurl his lightsaber into the rancor's head, disabling the cybernetics. The rest was all too easy for the Dark Lord of the Sith, who finished the rancor off with the ol' lightsaber stab to the brain. "All I am surrounded by is fear. And dead men." These were the chilling words Darth Vader uttered when surrounded by the collective force of the Rebel Alliance in the Vader Down crossover series. And Vader was right; it was the Rebellion that was in deep poo doo here. Tracking Luke Skywalker to a lost Jedi Temple on Vrogas Vas, Vader, alone, destroyed three squadrons of X-Wing Fighters before Luke Skywalker himself collided his X-Wing with Vader's TIE-Fighter, shooting the Dark Lord down. The Rebels then amassed in full force to kill Vader and... it didn't go so well for the Rebels, who were nearly all annihilated. Never has Vader's bad assery been on such thorough display. 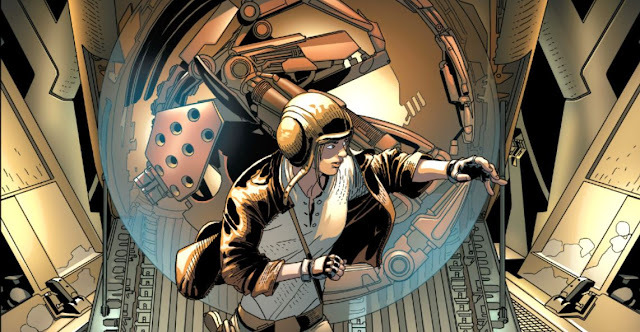 Vader Down also features hilarious confrontations between Vader's allies Dr. Aphra, BT-1, Triple Zero, and Wookiee bounty hunter Black Krrsantan vs. Luke Skywalker, Han Solo, Princess Leia, Chewbacca, C3P-0, and R2-D2, where we finally got to see Aphra fight Solo (whom she'd never heard of), and Chewbacca tear off Triple Zero's arm and beat him with it. Oh, and Vader battled another of Dr. Cylo's would be replacements for him, Karbin, a Mon Calamari trapped in the quadruple lightsaber-wielding cyborg body of General Grievous. That fight didn't go so well for Karbin. In the Darth Vader series' ultimate display of Vader's indomitable will and mastery of the Force, Vader's cybernetic body was deactivated by Dr. Cylo, who was revealed to be the robotics genius who created Vader's armored form. 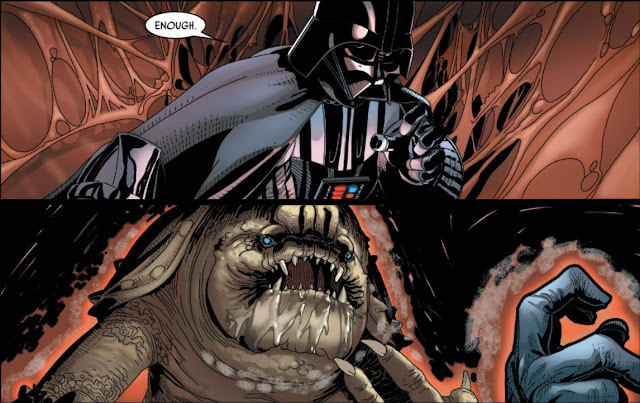 Cylo believed he achieved ultimate victory over Vader by simply shutting him off, but he sorely underestimated the amount of sheer hatred in Vader's heart. In a moving series of Star Wars: Episode III - Revenge of the Sith-inspired flashbacks and dream sequences, Gillen and Larroca depict Vader coping with a "Last Temptation of Anakin Skywalker" scenario, where Vader's memories of Obi-Wan and Padme plead with what's left of Anakin still within Vader, before Vader battles and overwhelms the last vestige of Anakin Skywalker. In the end, empowered by the Dark Side of the Force, Vader wills his cyborg body to reboot and finally executes Dr. Cylo with a lightsaber through the torso. It was an awe-inspiring moment once more proving that for Darth Vader, all is possible through the Force.